I am never going to pan fry cat fish in the Southern manner again. As much as I love the cornmeal-dredged classic recipe I grew up with, I have discovered that I prefer the Japanese way of pan-frying better. This is the method used to make tonkatsu–pan fried thin boneless pork cutlets with the most light, ethereal, crispy crust imaginable–adapted to catfish fillets. What is so special about tonkatsu? 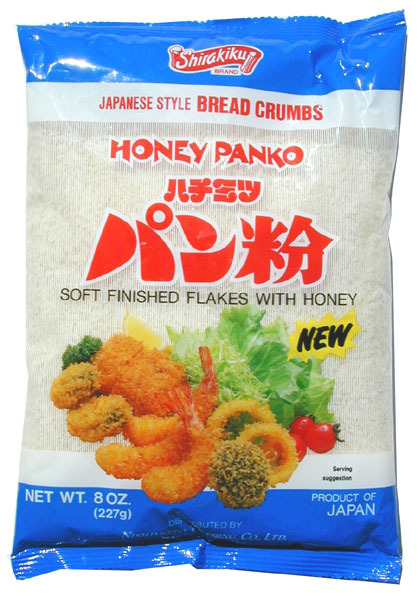 It is made from panko–a special Japanese breadcrumb that makes a light, crisp coating that is not just texturally fascinating, but also utterly delicious. Panko is made with crustless white bread and the bits are very crisp and irregularly shaped, making the the bits quite interesting in texture. My favorite type includes honey, making for a lightly sweet crust on whatever it coats. Panko makes tonkatsu a wonderful dining experience, but it turns a farmed catfish–one of the most safest, most sustainable fish choices available–fillets into a divine treat. 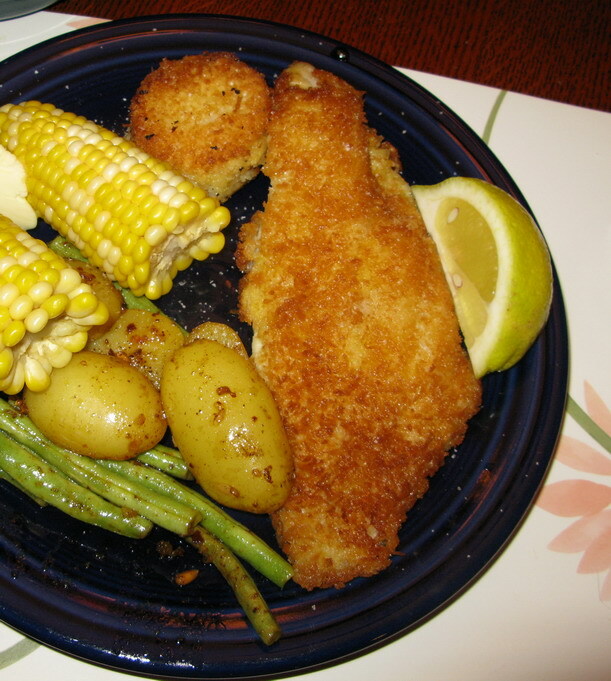 And panko coated fried catfish is simple to make–just as easy as the cornmeal crusted variety. But it tastes so much better. It takes a food that is fairly stereotypical to the Southern palate and makes it truly special. Salt and pepper both sides of catfish fillets well. Dredge 2 fillets in flour on both sides, shaking to remove excess. Pour oil into wide, heavy-bottomed skillet to depth of 1/2 inch. Heat on medium heat. Dip in egg, coating well on both sides, then lay on panko on plate, scooping crumbs and patting onto egg-coated fish to coat well. Lay fillets side by side in the pan, and cook without turning until you see the breadcrumbs on the edges of the fish begin to turn golden. Then, with a wide, long spatula, turn each fillet. The formerly bottom side should be golden brown and quite crisp. When fish is crisp on the other side, remove from pan, drain on paper towels and keep warm. Repeat with other two fillets, and serve immediately. I also like to keep panko on hand. I sometimes cut zucchini into 1/2″ slices, dredge them in a flour and cayenne mixture and then into an egg wash. Then I dip them into panko (which I’ve ground into a very fine powder). Then I fry these in canola oil. They are very delicious. This sounds delicious. As a woman with Southern roots, I grew up eating fried catfish. But I can’t give up my cornmeal yet? What else would I use to make hush puppies with? Hi Barbara! I made this for dinner tonight, and it was delightful! I’m a convert, too. Oh, I had one wee cucumber from the CSA bag, so I sliced it with a little onion and made cucumbers with vinager. (Like everyone’s Mom made.) Only this time, I used freshly ground Sichuan Peppercorns. It tasted wonderful with the apple cider vinager. Let me know if you give it a try. 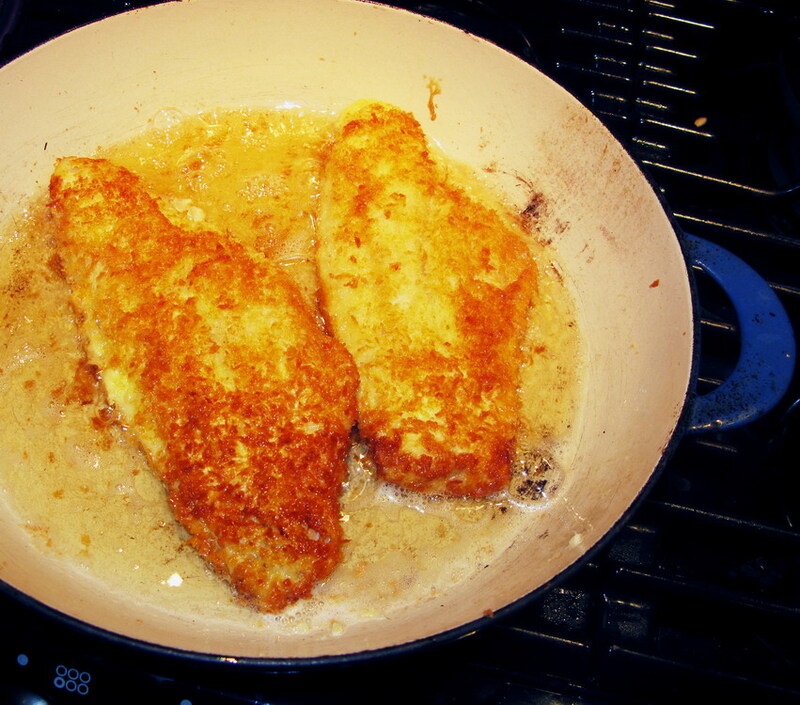 I deep fry them in my cast iron dutch oven, and it’s tilapia I use most often, but, agreed…perfection. For those who either don’t have eggs on hand or want to try something different- we’ve found brushing a nice mustard(poupon)on them and then dredging in panko makes for an easy and delicious dish. I tried the flour then egg then the Panko and could not get the egg to stick to the flour. Any suggestions? Jerry–beat into the eggs a couple of teaspoons of water. The water may bind with the proteins in the eggs to help it stick to the flour. OR, just use egg whites and water, and leave the egg yolks out. The proteins in egg allow it to cling to the flour, not the fat in the egg yolk. I first dip my fish in flour, shake off excess, then dip in milk, followed by the panko crumbs. Let sit for about 30 min. and the crust will adhere nicely to the fish. I learned this from a chef in California years ago. It’s really great on halibut!